Students from Dr. Martin Luther King, Jr. Academic Middle School board a special 54-line that goes directly from the front of school and does not stop for passengers. These students do not need to pay fare when boarding this bus. Photo by Nelson Estrada. UPDATE: Despite the growing interest to make Muni free for children 17 and younger, money still remains a key issue. 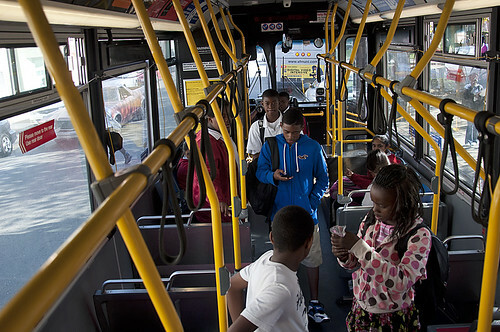 An estimate by Muni suggests that about 15 percent of riders are younger than 18. The agency has a $781 million operating budget but is facing a $23 million deficit. The plan for free ridership would cost between $6 million and $13 million a year. On October 18th the Board of Supervisors passed a resolution to give free ridership to children, but its up to Muni to decide. With the current budget crisis and service cuts, it seems unlikely. The date of the next Board of Supervisors meeting has not been decided. When the bell rings at 3 p.m., many of San Francisco’s younger residents crowd the buses and light rail trains as they spider out into the city back home. Like many an SF State student, these kids sometimes encounter financial difficulties and choose to sneak on through the back of the bus. A new plan with various community supporters has been proposed by the Board of Supervisors which would allow youth to ride Muni for free, helping alleviate the concern of parents who are struggling to send their children to school after budget cuts that have eliminated 11 yellow school buses. Muni generates close to $200 million of their $800 million dollar budget through fares, according to SFGate. With fare evasion always a problem, and with ever-increasing debts and deficits, cutting fare for a large population of school-aged children could potentially have a large impact on a transportation system that is heavily strained. However, offering free ridership which could possibly increase the deficit may be the only way to help get children to school. Kate Faria, member of People Organized to Win Employee Rights who has spoken with bus riders and community members, has seen the difficulty low-income families have experienced in trying to take public transportation. During a San Francisco Youth Commission meeting on Sept. 19th, community members spoke up about the resolution. “The youth commission strongly urges the mayor, the Board of Supervisors, the Board of Education and SFMTA to continue to work together to support, improve and implement free Muni for all San Francisco’s young people,” said Youth Commission Chairwoman Leah LaCroix.